Last week while C was watching PBS Kids, one of the commercials* mentioned that there was going to be a character meet-and-greet about an hour from our home. Now, I wrote a lot during my pregnancy that I was very wary of what I like to call “kid culture.” I refuse to eat at any restaurant featuring a ball pit, and the idea of listening to The Wiggles in place of The Beatles or even Passion Pit just because it’s “kid-friendly” tears at my soul a little. We are a one-dinner family; if I can help it, I don’t make one meal for the grownups and another for the kid. Child cannot subsist on graham crackers alone. *If you even want to call them that. One of the reasons that I love PBS so much is that the messages that they squeeze in-between programs only publicize PBS-related shows or activities. I haven’t seen a real-live commercial for close to three years because we don’t really watch any other channel. We’re those people. At first glance, driving 65 miles to see an adult dressed up as Super Why might seem like the kind of thing only the most whipped of parents would do. I own that. 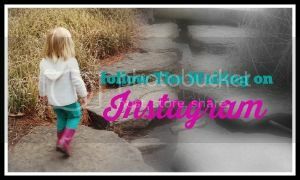 However, in my nearly two years as a parent, I have learned that sometimes you do the things you said you’d never do simply because you like your kid and you want to see them happy. Some people may call this spoiling them, but I see it as meeting them where they are. Sometimes you even learn that there’s a part of you – completely independent of them – that can get down with Ella Jenkins and Laurie Berkner. That’s where we found ourselves last week. 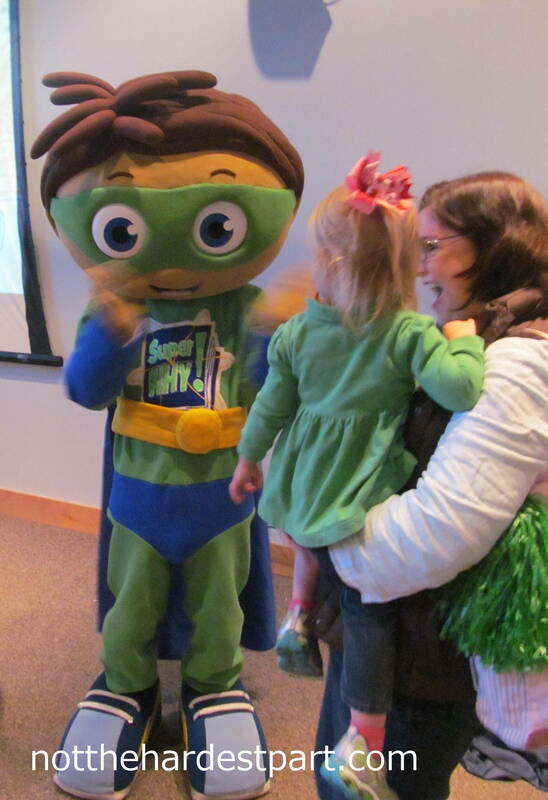 Since all the characters from Super Why – one of C’s favorite shows – were going to be there, we were in. Our cousin Wes also lives in the city where the event was to be held, so the promise of seeing him sealed the deal. It was going to be a fun day. We made the drive and had a great brunch with my cousin. I was even able to convince C that juevos rancheros were actually just egg tacos. Yep, she deserved to see her characters for that alone! Sid is the poster child of the things I tolerate for my kid. We arrived at the character event a little early, but it was at a children’s museum so there was plenty to distract C with before the big show. 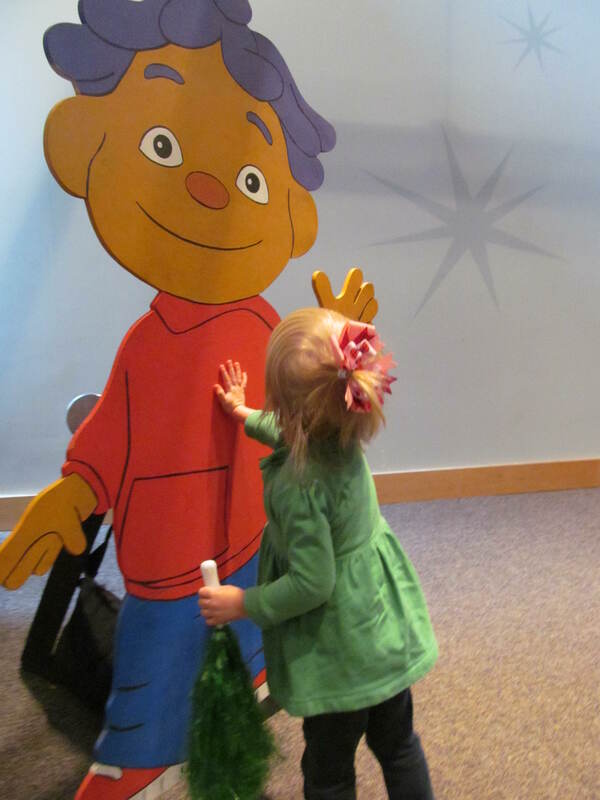 Once she caught a glimpse of a cutout of Sid the Science Kid, though, she wasn’t interested in any of the more involved exhibits the museum had to offer. One of the UNC-TV organizers of the event came out and said that the characters – Super Why, Read-A-Roo, Betsy from Betsy’s Kindergarten Adventures, and Mr. McFeely – would be coming out soon. When I heard Mr. McFeely’s name, I just assumed that it would be someone dressed up in a Speedy Delivery costume, not the actual man himself who was such a big part of one of my favorite shows growing up, Mister Rogers’ Neighborhood. We all know what happens when you assume, right? Mr. McFeely even brought Daniel Tiger! Pretty much every parent at the event melt into a pool of their own childhood at that point. I was thrilled when the man himself came out from a side door with his Speedy Delivery bag. 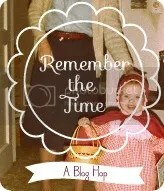 In case you missed it, I am kind of obsessed with anything related to Mr. Rogers. C didn’t get the full weight of what was happening, since she’s still at an age where the puppets of the Neighborhood of Make-Believe are more interesting to her than the actual humans on the show. But I could hardly contain my own excitement and giddiness for what was going on. 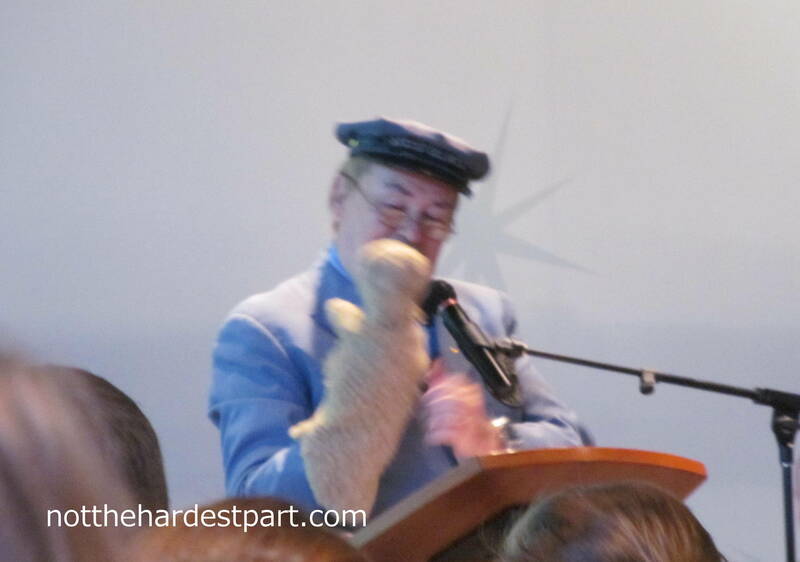 David Newell, the original Mr. McFeely, was in the room with us. If this is what happens when you finally lower your standards and partake in a little kid culture, then I had been missing out. The only thing was, we had to wait in line to meet all the characters, and lines and toddlers mix about as well as orange juice and toothpaste. C was already totally out of her routine and reaching the end of her rope, so as we stood in line to meet Mr. McFeely, she started getting upset and B suggested that we skip Mr. McFeely and move onto Alpha Pig. I pretended not to hear him. Obviously. C was fascinated yet terrified of Super Why. I held our place in line while B tried to diffuse the situation, and once it was finally our turn, I completely geeked out. You’d think I was meeting Paul McCartney. 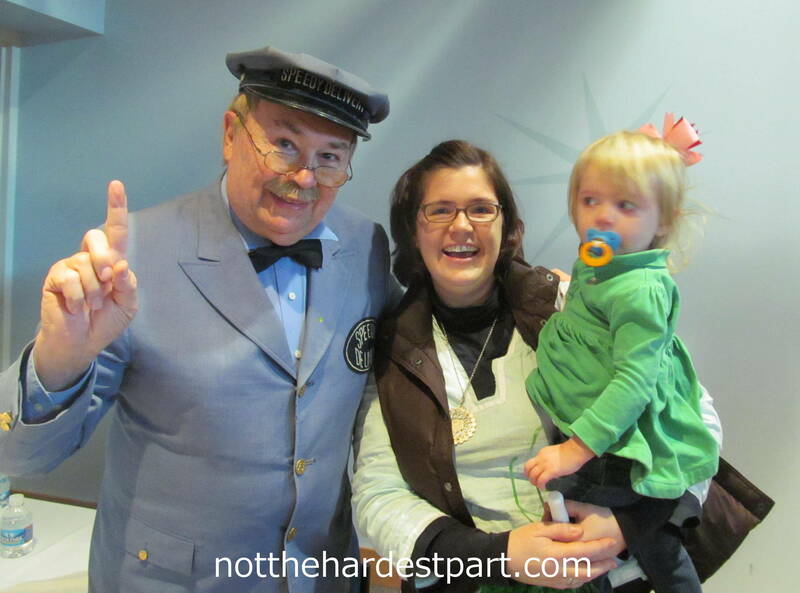 It was pretty obvious Mr. Newell was well-acquainted with the situation our family found itself in: kid wants to see a mute Super Why and couldn’t care less about a strange man in blue delivery uniform, mom wants to be a little girl for a second and tell Mr. McFeely all he represents to her. While C looked on, Mr. Newell asked me where I grew up, and he immediately identified WKNO as the PBS station in Memphis. He was friendly and kind, and he seemed to understand that the grown adult who stood before him was once a little girl who trusted him and the company he kept as much as she trusted her parents and teachers. I think he knew that we were there just as much for me as we were for our daughter. I asked him to sign an autograph for C. He did, but in one motion he pulled out another headshot and asked me what my name was so he could make one out for me too. That gesture spoke volumes to me. The legacy of Fred Rogers was to care for children by preserving their innocence and respecting the seemingly small things that are important to them. It turns out, those children grow up, and they are still just as important. Needless to say, it was a wonderful day and one we will remember for a long time. It was the day that Mommy was a kid again and learned that magic happens outside the Neighborhood of Make-Believe. 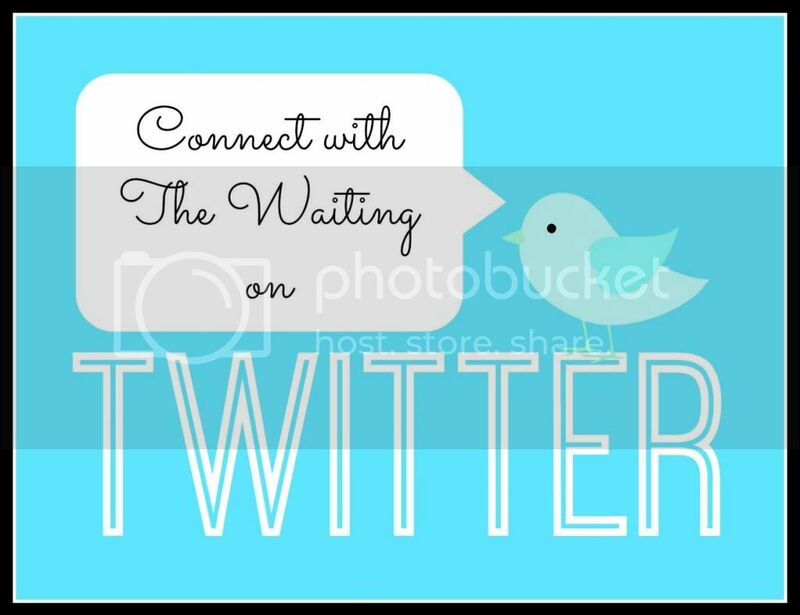 Like me on Facebook? You should totally like me on Facebook. It’s like a warm puppy in your heart. Or bacon. Or the auto-tuned Mr. Rogers video on YouTube. WHOO HOO FOR PBS AND THEIR CELEBRITIES! AND WHOO HOO FOR US FOR LOVING THEM!!! Agreed. I had forgotten his name and was expecting a completely different post. This story was much better than the lurid tale I was imagining. That’s so awesome! I loved that show and Mr. McFeely growing up – although I always got a little freaked out about his name. I know what you mean about doing things for your kids. We once drove 7 hours so that my son could ride on an actual working replica of Thomas the Tank Engine. And he still talks about it 10 years later. Oh, my gosh! How amazing! Let me assure you, most of the kid events are not like that. You haven’t missed much up until now. Yeah, that’s kind of what I thought. We took her to Barnes and Noble awhile back to visit Curious George, and it was a melee. Good thing they had a Starbucks there too or I probably would have cried. 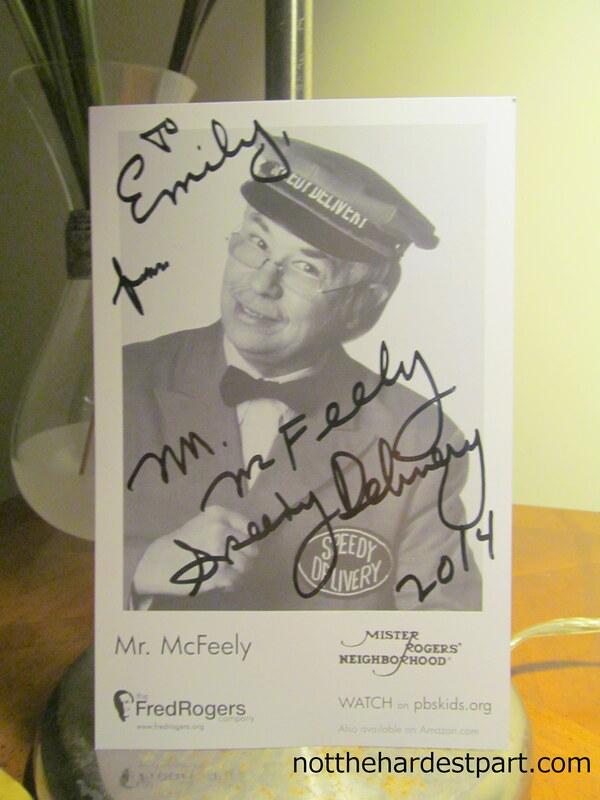 Ah, good ol’ dependable Mr. McFeely! Mr. Rogers’ Neighborhood didn’t have the glitz or the frenetic activity of the early Sesame Street, but my kids loved it. I always thought that keeping the land of make-believe separate from the land of the living was a marvelous idea. Today’s kids seem to have a hard time knowing the difference. I’m feeling all mushy and gushy!!! I felt like a kid just reading about YOU feeling like a kid. It’s like he was everything I dreamed he would be. And when I look at that picture of you and C with Mr. McFeely, it looks almost exactly like the picture of me and Grace with Peter Tork of the Monkees. Grace was two when I met him, and I was all excited for her to actually meet a Monkee. She couldn’t have cared less. But I was all giddy and felt nine years old all over again. In the picture, I have the biggest smile on my face, and Grace is literally just staring blankly at Peter. That moment was totally for me, even though I still try to make her think it was a big deal that she met him. She talks about it like she met one of my co-workers. Next time the Monkees are in town, you should totally arrange a second meeting for them and your kids. I think they’d appreciate it. Totally. And I’m sure I have the pull to make that happen. It is such a rare opportunity for me to be a kid! Life with a toddler doesn’t really present those chances very often, especially when I’m trying to convince my daughter that it’s not a good idea to dance on the coffee table. In that last pic, the expressions of you and your daughter say it all. I’m with you – Rock on, Mr McFeeley! OMG, that’s not the only picture either. In the other one, she is full-on glaring at him. Good times. I’m so glad that show was a part of my childhood. I’m even gladder that it’s a part of my life now! Oh this makes me so happy! :) love it! And lovethat he signed a picture for you too :) it kind of reglorifies and justifies my childhood memories of mister rogers. This made me sniffly. It is just so cool he signed a photo for you, too. That speaks volumes about him. I would have gone to meet him in a heartbeat, and I would have had just as big of a grin as you did! Awesome! I got teary. Those were the good ‘ol shows. Have you seen the junk on television for kids today? Yikes! Nice to know some of the classics are still going. I have seen a lot of it, and I agree, a lot of it is total garbage. We pretty much stick 100% to the kids programming on PBS. (I sound like such an ad for them!) C also has a DVD with classic Mickey Mouse cartoons that she really likes and that I don’t mind her watching. Cute post, Em….we all get gray, but hopefully our minds never do. My nephew thought Mr. McFeely’s name was “Speedy Delivery.” I went to see Captain Kangaroo when I was a kid and took Robin to see Blues Clues Live. I had almost as much fun as he did. Having a kid is such a gift. It really is. Ben and I have a bet going on how long it’s going to take us to avoid seeing Sesame Street Live. If I could, I would go with you! We are still recycling bits of dialogue from Blue’s Clues Live. C looks a little sketched out my Mr. McFeely! Such a cute picture. Emily you brought tears to this old girl’s eyes. I love it! The cherry on top is the way C is keeping her eye on him in that last pic. Oh man, she was *completely* wary of the entire situation. My husband was ready to jump in and whisk her away at any second, but she kept the tears at bay for the duration of the photo session. ;D Thanks, Joan! Seriously, I watched that show every single day as a kid. It was the last good TV show ever made for kids. Now they have poo for entertainment, and I’m sorry it has to be that way. I was pretty vulgar when I blogged about Elmo. But he had it coming. Mr. Rogers was the best, such an icon in my own childhood as well. The more I read about him, the more I am amazed at what an incredible person he was and why the kids TV he made was so revolutionary, even for today. The Fred Rogers Institute is producing a lot of new shows that I really like, so I’m glad to see his legacy in action. I can’t believe he’s still alive! I actually went to one of these types of things when I was a kid and got an autographed picture. I know, right?! That was the first thing I said to my mom when I told her we had met him, but she said that back in the day they dressed Mr. McFeely to look a lot older than he actually was. Still, though, he was in great shape! One time, I heard that my favorite childhood musician (Bill Harley) was going to be at my local library, and I totally drove myself there to hear him sing and I stood in line and waited until last (I just couldn’t bring myself to go in front of any actual kid) and he signed my CD for me. He asked me what my favorite song was, and I named one that was nearly 20 years old. Really made my year! Isn’t it awesome when things come full-circle like that? It’s like we tap into a part of our brains that we had kind of abandoned for 20 years. It makes one giddy! I love remembering what it felt like to be a kid. I can relate. When I was in college a few years ago, Fred Penner gave a guest lecture to my music business class. (Not sure how well known he is south of the border, but he’s been a beloved children’s entertainer here in Canada for decades.) I watched his show when I was a kid, so I was pretty stoked when, at the end of his lecture, he pulled out his guitar and sung a few songs for us. The entire lecture room was singing along to “The Cat Came Back” and I felt like a 5-year-old again for a few glorious moments! OMG I TOTALLY KNOW THAT SONG!!! I remember that they played it between shows on Nickelodeon when I was really, really young, and my family all loved it and giggled over the animation that came with it. A few years ago, I mentioned it to my husband to see if he knew it too and he did and we had a happy little moment. I totally would have geeked out too if I got to meet him! Good story. I have never seen my son more excited (or happy) than when he had a meet and greet with Barney. It’s not spoiling them – it’s loving them. Amen. It’s the little things that really make a difference. I bet he hates George Carlin. He was the train conductor on a show all about trains! McFeely was far more minor in the grand scheme of things. My husband just kept saying that Speedy Delivery probably got bought out by FedEx. So sweet!! I love this one. :) I haven’t taken my kids to anything like this either. Maybe I should! And, I LOVE PBS. I grew up on Mr Rogers, too, in his actual neighborhood. This was a charming post, many happy memories. Wasn’t it wonderful that the event provided a celebrity for the grownups? I miss the Mr. Rogers show more than I can say. You scored, little gal. Have you a frame for your picture, or shall I send you one? And by the way, orange juice mixes with many things. My nephew Lyle mixed his with milk. Just so you know! I love C’s face in that picture!